We are easy to find!. Use the map below for turn-by-turn directions. 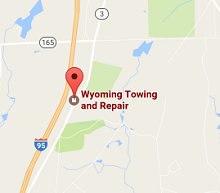 Wyoming Towing & Repair is serving Exeter, Rhode Island and the surrounding areas.